Day one in Abu Dhabi. I’ve just stepped off a 15 hour flight and it’s 8:00 a.m. local time. I barely slept on the flight and right now I feel like I might die. I have no idea how I will make it through the next two hours, much less until an acceptable sleeping time later in the evening. I also have no idea how much better my life is going to be in mere hours because I will observe what most people consider a once-in-a-lifetime opportunity. After getting to the hotel, checking in, figuring out the rest of the day and making dinner plans with the hubby’s co-workers, it was time for a walk. The idea was just to keep moving to avoid collapsing into a heap and sleeping for the next 36 hours straight. It was a balmy 110 with about 50% humidity, but the sticky exploration of the city was just what we needed. Upon arriving back at the room, I sent off a couple emails to the family so they knew I was alive, then showered before dinner. Never would I have expected such a curious scene when I emerged from the shower. It energized me and made me forget the horrible jet lag. I walked to the window, wrapped in a robe, hoping to take in the beginning of a lovely Abu Dhabi sunset. But it was no longer gorgeous and sunny. The sun had disappeared in the short time it took me to shower. In fact, it looked weird outside. Really weird. And getting weirder by the moment. I had an eerie feeling I once had experienced in high school while walking outside during a solar eclipse. 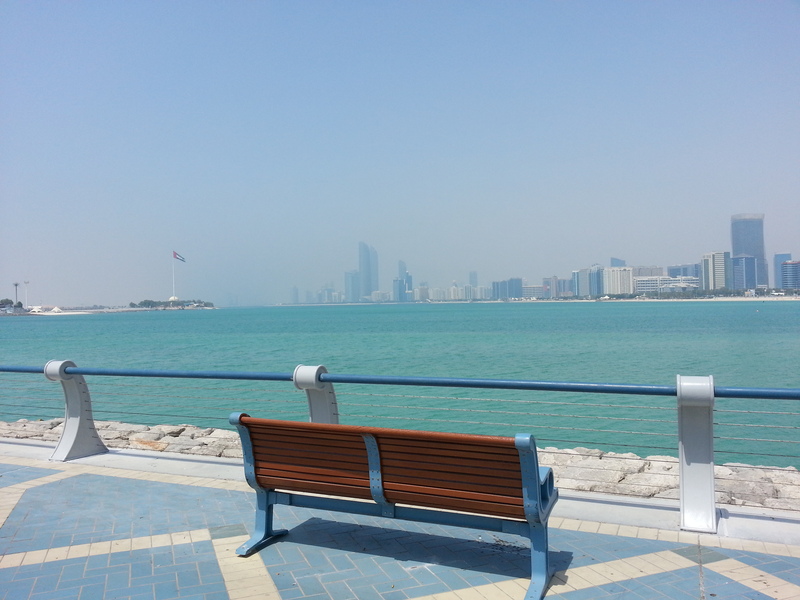 I remembered from last time I visted that Abu Dhabi has “dust days” when sand and particulate filled the air and blow around, creating a smog-like haze. But this seemed… different. “You probably just didn’t notice how hazy it was when we were outside in the middle of it,” the hubby offered. But I wasn’t convinced. At this point, I realized I wasn’t crazy, something unusual was indeed happening. I grew so excited I began vibrating and pacing. My beloved companion tried preserving my purity by walking over and checking that my robe wasn’t flapping open in front of the window while I hopped around like a dancing flea. How could he care about the security of my robe at a time like this? IT WAS A SANDSTORM! Just for the sake of comparison, here’s a photo of what the city typically looks like. A little hazy around the edges, but still beautiful in the blazing sun. Note how far you can see on one of the “dust days” and how during the sandstorm I barely could see across the street. Once he realized it was indeed a sandstorm, my husband grew pretty excited as well. It certainly wasn’t like in the movies when a huge wall of sand barrels over the horizon and covers everything with layers of sand. It started slow and built, coming in like a subtle fog. But then it lingered for hours as a haze over the city, shrouding the tall buildings in a mysterious veil. I learned many things thanks to the wondrous occurrence. 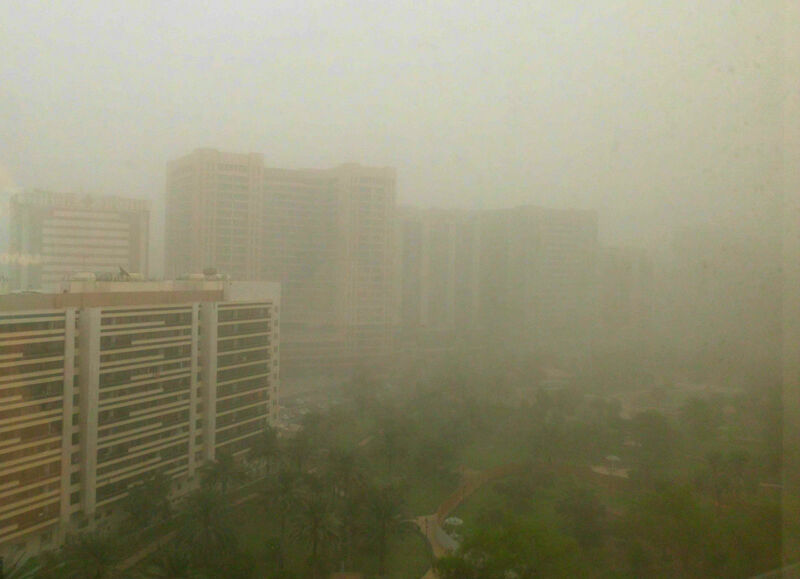 First, technically it was not a sandstorm, but a dust storm. Much like our rain storms, there are many different levels and classifications. This one was made up of small particulate, but not necessarily desert sand, and wasn’t so thick as to instantly choke people outside. So they call it a dust storm. Secondly, the Arabic word for sandstorm is haboob. No matter what, that is just fun to say. Thirdly, I thought only tourists would be super excited about it, but apparently these storms aren’t as common as I had anticipated. The locals also thought it was fun to see and talked about it for the next two days. I love pleasant unexpected surprises, and this certainly qualifies as one. I’m appreciative to have witnessed such an unusual natural occurrence. The only problem is now that I’ve experienced how fun a sandstorm can be, I want to see one of the big haboobs roll in. From the safety of inside a building, of course. Maybe someday.